The guiding curriculum for the 4-H Robotics Program is the 4-H Robotics Year Round Training Guide. Use this comprehensive curriculum to develop your county program. There are nine modules. You and your volunteer can work through each of the nine modules at your own pace. Review the Getting Started Guide first and then complete the pre-assessment survey. Your Extension Agent will have the code necessary to access the survey. The survey is confidential and optional. The results will only be shared with your Extension Agent and the State Specialist. It is intended to help us determine what further trainings are needed. Now you are ready to work through each of the nine modules below. They do not have to be completed at one time. 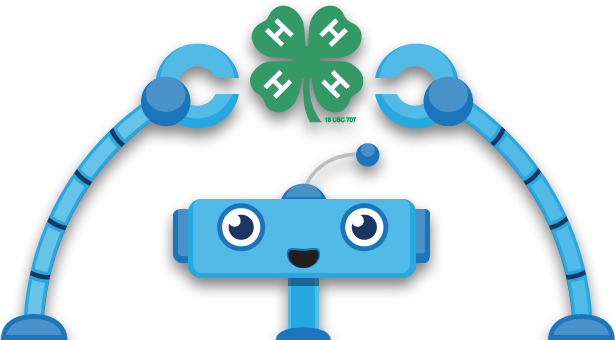 The 4-H Robotics Year Round Training Guide will assist you in establishing your robotics club, but you will still need additional curriculum and resources to help with the programming of the actual robots. Please use the robotics curriculum and resources below in your planning meetings. Are there any plans to move to the EV3 for Juniors or the Java for Snapdragon for Seniors in the near future? We are exploring the possibilities of these platforms, but any final decision will depend upon available funding. When evaluating your county program, you can utilize the following general evaluation tools or use evaluation tools specific to the curriculum. The 4-H computer project complements the 4-H robotics project. This project seeks to develop youth’s ability to think logically and develop other programming skills.